Pet stairs/ramps are an easy and economical way to help dogs reach high-up places, including tall beds and vehicles. Pets that constantly jump off sofas and beds can place a certain degree of strain on the joints which could in the long term lead to arthritis. This can be avoided using pet stairs. In particular, older pets may need help getting into your car or reaching up to high-up places such as sofas and beds. Pet stairs can be of great help in such cases. Note that many pets will take to the stairs immediately, while others may require some training. Placing treats on the steps will encourage your pet to climb. One way to encourage them to start using the stairs is by covering some of the steps with something that they like, such as a familiar blanket with treats placed on top. This can also help pets overcome any hesitation they may have. If your pet becomes nervous and anxious while training, it would be helpful to give them a break and let them learn to use the stairs at their own pace. This article will compare the most popular pet stairs (ramps) made by Solvit, Animal Planet and Pet Gear. These were not just among the most popular among Amazon customers at the time this article was written, but they had also received good reviews from most Amazon customers who have used them. Selected Pet Stairs on Amazon. The maximum load numbers are according to the product description/specification of each product. The innovative incline of each step found on the Pet Gear stairs reduces the amount of height needed to be climbed with each step, eliminating some degree of stress on your pet. 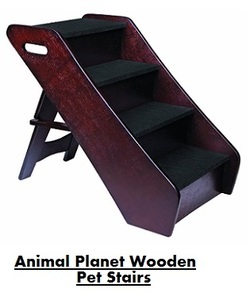 Both Solvit and Animal Planet stairs can be folded into the closed position for storage or travel. This feature is not available with the Pet Gear stairs. So which pet stairs to buy? If your pet is over 60 lbs, you should consider either Solvit or Pet Gear. If you prefer one that has side rail guides for safety, then you should consider either Solvit or Animal Planet. If you will be using the stairs so that your dog can easily get into your car, then you should consider either Solvit or Animal Planet, as these fold easily for storage in your car. If your dog is less than 60 lbs, and style and appearance is important for you, you should consider the stylish espresso brown wood Animal Planet with slate gray design that can match any home decor. If you have slick floors and require rubberized non-slip feet or rubber grippers on the bottom, then you should consider Pet Gear Easy Step IV or Animal Planet. Please click the pet stairs of your choice below for price information or to purchase.